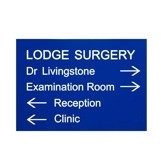 We can supply both internal and external directional signs and wayfinding signs in a full range of metals and plastics. Suitable for offices, car parks, schools, doctor's surgeries, dental practices, veterinary surgeries, banks and building societies. All signs can be engraved with text and logos or alternatively supplied in vinyl lettering.